Learning to DO: 27:23: What Happened? I ran a race last night. I ran an 8k cross country race on a very fast course. Given that my college PR was only 27:34 I thought that considering I had run 8k during a 10k in April in 25:45 and 5 miles in a half marathon last fall in 26:58 I should be able to waltz my way to a 26 flat finish. That did not happen. Given that slowing down dramatically is a relatively common occurrence, not just for me, I thought I would lay out what happened. Not so that I can prevent it from ever happening in the future, but when it counts, in the big races, I will not make the same mistakes. 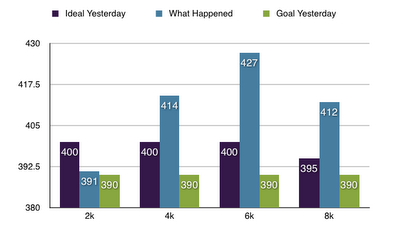 I will explain in graphs. This first graph is a graph of my splits. The light blue is the horror story. Now to run 26:00 one must average 6:30 per 2k. That's what I intended to do. However, I'm not in shape to do that. My lactate threshold and anaerobic capacity and aerobic capacity are not at levels for me to do that right now. So Had I run a more conservative race such as the dark blue, I would have ended up with a better time instead of getting passed by 60 or so people over the last 6k. So what happened is that I went out too hard and even five seconds per kilometer is enough to dramatically shift the amount of lactic acid accumulation, especially to a moderately trained individual such as myself. The dark blue is about how it should have gone down, but the light blue is about how it went down. I went out too hard and I did not have the aerobic capacity to handle all of the lactic acid in my legs. Once you get above a certain level somewhere in the range of 4-10mmol/l (I'm making that range up, but it's a pretty good estimate based on Canova, Daniels, Noakes, etc.) your body can not clean out any additional lactic acid so it just accumulates until the running either stops or proceeds very slowly (7 minute miles or slower for me). 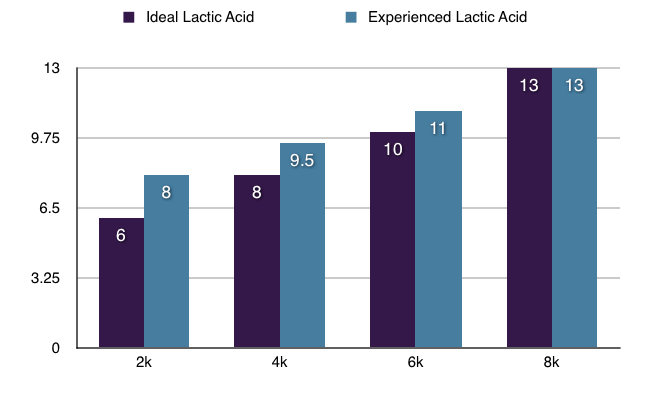 I am drawing on the assumption that 4 mmol/l lactic acid in the blood is about half marathon pace for me and the approximate pace that one can maintain and produce lactic acid at the same rate it can be processed. In other words, going over that threshold means that the legs get heavier with every step, even if the pace slows marginally. In other words, if the pace slows from 8 mmol/l to 5 mmol/l you end up with a net of 9 mmol/l because the pace is still more than your body can aerobically clear out. Plus, my legs felt heavy on the warmup because I have been upping the mileage, I might even get over 80 miles this week for the first time since May. Increasing mileage is the most physically stressful part of a training cycle and it does not make racing any easier. Lest this be a self-pitty-fest UD did great! Well, 23rd out of 34 for the men isn't exactly great, but it is far better than we did last year and we have nine men under 30 minutes. On the women's side we did even better at 17th out of 32 teams with most our top runners in the 24s and 25s. Our women's team is more experienced than our men's and that helps at the longer distances. Our team had a good night and we are in a great place to build on and really turn some heads over the next few weeks, months and years. One other event happened, which I must mention because I feel it is important. I was out sprinted by 0.3 seconds in the last 15 meters by one person on our men's team who has never beat me before last night. So now both of our top two men have beaten me. It's important because I think they see my PRs and see me tearing it up in practice every day and think that somehow I am better than they are. Which is totally not true. I am sure that over the next two years both of them, and perhaps more on our team, can develop into D3 national caliber runners, something I still have not done yet despite running the 3476th fastest marathon time in the world in 2011.